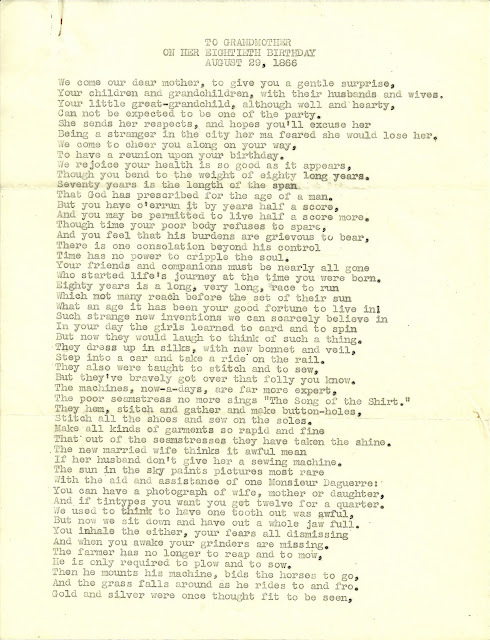 I found this mimeographed copy of an 1866 poem in an envelope postmarked 1950 from a Cambridge, Massachusetts, woman to a couple in Auburn, Maine. 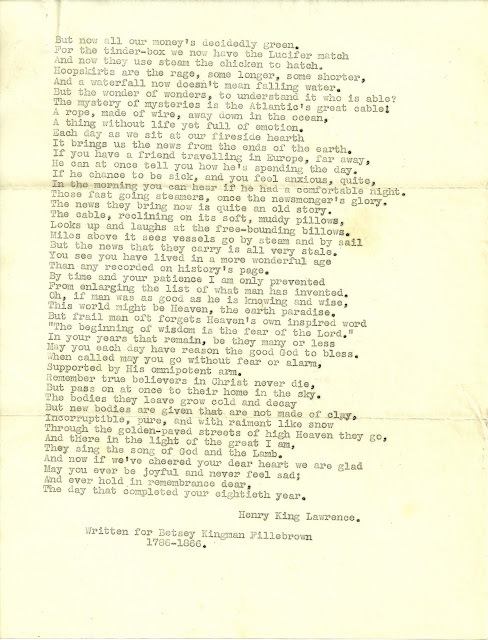 The poem was written by Henry King Lawrence on the occasion of the 80th birthday of his wife's mother, Betsey Kingman Fillebrown (1786-1866). Betsey Kingman, according to [hopefully correct] information I found online, was born in 1786, the daughter of John and Anna (French) Kingman. She married James Fillebrown, the son of John and Elizabeth (Gould) Fillebrown. Betsey and James had three children: James, Elizabeth and Frances Louisa. 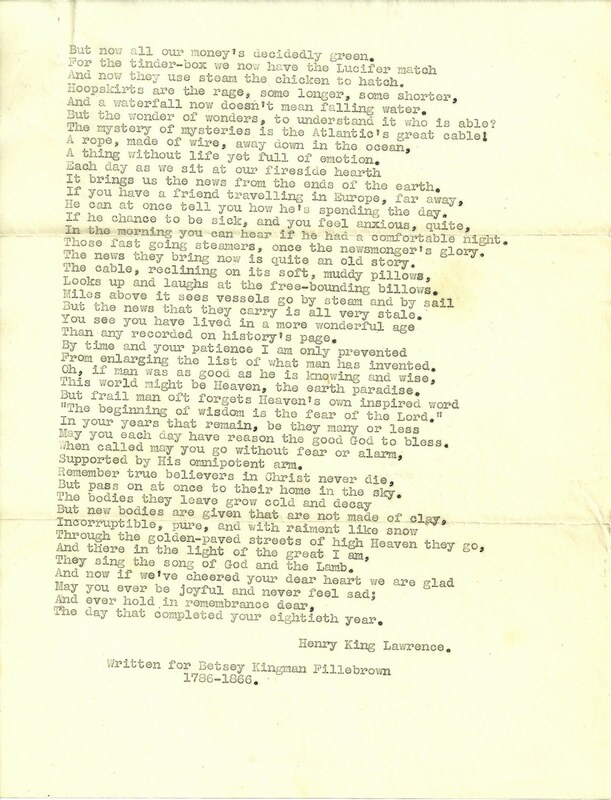 Daughter Elizabeth married the poem's author, Henry King Lawrence. Your children and grandchildren with their husbands and wives. Can not be expected to be one of the party. Being a stranger in the city her ma feared she would lose her. To have a reunion upon your birthday. Though you bend to the weight of eighty long years. That God has prescribed for the age of a man. And you may be permitted to live half a score more. Time has no power to cripple the soul. Who started life's journey at the time you were born. What an age it has been your good fortune to live in! Such strange new inventions we can scarcely believe in! But now they would laugh to think of such a thing. Step into a car and take a ride on the rail. But they've bravely got over that folly you know. The poor seamstress no more sings "The Song of the Shirt". Stitch all the shoes and sew on the soles. That out of the seamstresses they have taken the shine. If her husband don't give her a sewing machine. And if tintypes you want you get twelve for a quarter. But now we sit down and have out a whole jaw full. And when you awake your grinders are missing. He is only required to plow and to sow. And the grass falls around as he rides to and fro. But now all our money's decidedly green. And now they use steam the chicken to hatch. And a waterfall now doesn't mean falling water. But the wonder of wonders, to understand it who is able? The mystery of mysteries is the Atlantic's great cable! A thing without life yet full of emotion. It brings us the news from the ends of the earth. He can at once tell you now he's spending the day. In the morning you can hear if he had a comfortable night. Those fast going steamers, once the newsmonger's glory. The news they bring now is quite an old story. Looks up and laughs at the free-bounding billows. But the news that they carry is all very stale. Than any recorded on history's page. From enlarging the list of what man has invented. This world might be Heaven, the earth paradise. "The beginning of wisdom is the fear of the Lord." May you each day have reason the good God to bless. Supported by His omnipotent arm. But pass on at once to their home in the sky. But new bodies are given that are not made of clay. They sing the song of God and the Lamb. The day that completed your eightieth year. 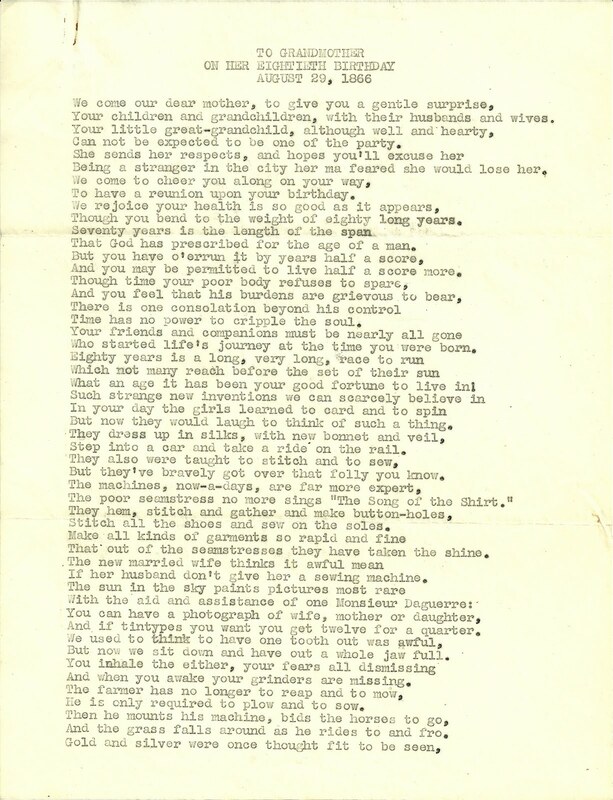 Written for Betsey Kingman Fillebrown, 1786-1866. I found some references online to a later death date than 1866 for Betsey (Kingman) Fillebrown. I'm not sure if she actually died in 1866, as this poem seems to indicate, or if the author was showing the range of her life at her 80th birthday. Hopefully you will find this poem not only charming, but personally meaningful as well. Thanks for stopping by!